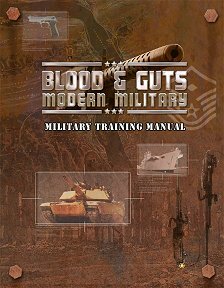 The first volume of the redeveloped Blood and Guts series, this looks at the various kinds of training available to soldiers, and also examines skills, feats, advanced training, rank structures and even medals. Publisher's blurb: "The premier modern military sourcebook for the d20 system is reborn with Blood and Guts 2. Redesign from the ground up by modern d20 guru Charles Rice, Blood and Guts 2 promises to be more flexible and adaptable, allowing players and game masters to build soldiers of any military specialty from around the world."